The beloved teacher and author of the million-and-a-half copy bestseller Writing Down the Bones reveals new breakthrough writing guidance as she recounts profound lessons she has learned from a lifetime of teaching and practice. Sit. Walk. Write. These are the barest bones of Natalie Goldberg’s revolutionary writing and life practice, which she presents here in book form for the first time. A whole new slant on writing that she developed since the publication of her classic Writing Down the Bones, True Secret workshops have been limited until now to small, intensive groups at a remote center in the rural Southwest. 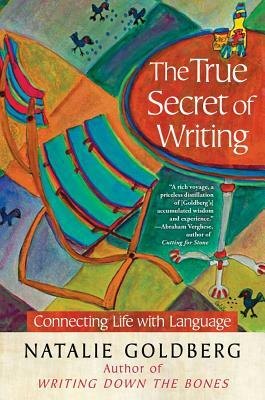 In The True Secret of Writing, Goldberg makes this popular seminar available to any reader. The True Secret is for everyone, like eating and sleeping. It allows you to discover something real about your life, to mine the rich awareness in your mind, and to ground and empower yourself. Goldberg guides you through your own personal or group retreat, illuminating the steps of sitting in silent open mind, walking anchored to the earth, and writing without criticism. Just as Goldberg cuts through her students’ resistance with her no-nonsense instruction—“Shut up and write”—the True Secret cuts to the core of realizing yourself and your world. The capstone to forty years of teaching, The True Secret of Writing is Goldberg’s Zen boot camp, her legacy teaching. Stories of Natalie’s own search for truth and clarity and her students’ breakthroughs and insights give moving testament to how brilliantly her unique, tough-love method works. Beautiful homages to the work of other great teachers and observers of mind, life, and love provide further secrets and inspiration to which readers will return again and again. In her inimitable way, Goldberg will inspire you to pick up the pen, get writing, and keep going. The True Secret of Writing will help you with your writing—and your life. Natalie Goldberg is a poet, painter, teacher, and the author of twelve books, including her classic, Writing Down the Bones: Freeing the Writer Within (which has sold more than 1.5 million copies) and Old Friend from Far Away: The Practice of Writing Memoir. She has been teaching seminars for thirty-five years to people from around the world and lives in New Mexico. "Heartfelt, funny, wise, pleading, calm, and ferocious, Natalie just makes you want to write!" "Beautifully written, informative, intriguing, and passionate, The True Secret of Writing is a book to be appreciated, read, and reread by the beginning writer as well as the published professional. Natalie captures the pulse and spirit of the writing life with pristine clarity." "A uniquely delivered Eastern Zen approach to writing....A pleasantly meditative intuitive writing guide."